You and this book can help change the world. And while quantities last, it won't cost you a thing. BookCrossing.com and The Dignitarian Dialogues, a project of the Harnisch Family Foundation, have joined forces to give away 5,000 copies of Somebodies and Nobodies - Overcoming the Abuse of Rank by Robert W. Fuller. We want each copy of this important book to travel far and wide, reaching as many thoughtful readers as possible. If you're interested and want to help this project, at absolutely no cost or obligation, sign up for your copy at www.bookcrossing.com/freebook. We'll even pay the shipping! 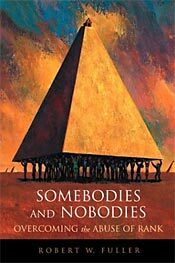 Somebodies and Nobodies is a book about "rankism" (a new blanket-term that covers racism, sexism, ageism, etc.) that dares to imagine a "dignitarian" world: one in which we treat each other with dignity regardless of our rank. When we treat people of different ranks with equal dignity, we overcome rankism, just as we overcome racism by treating people of different races with equal dignity. Overcoming rankism is the next, natural, evolutionary step for democracy. And this book explains how best to do it. Since there will be so many BookCrossers reading Somebodies and Nobodies concurrently, we've set up its own discussion forum. Click on over and join the conversation.